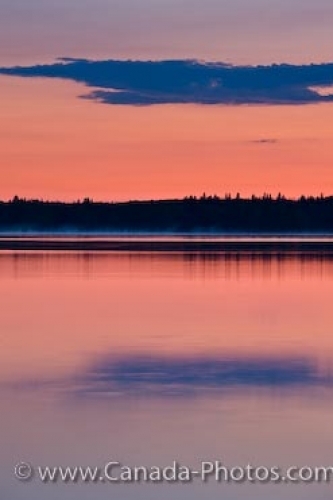 Lake Audy in Riding Mountain National Park in Manitoba, Canada is like a sheet of glass giving the stunning sunset colors a prime opportunity to reflect their beauty off the surface of the lake. A single cloud hangs over Lake Audy while the rest of the sky is radiant with its pink, orange and yellow hues as the sunset hours begin to come to a close. Visitors to Lake Audy can camp along the shores, the perfect location to watch a sunset decorate the Manitoba sky. During the day, visitors will partake in the various activities available around Lake Audy such as swimming, fishing and boating but the tranquility is what attracts many visitors to the lake in Riding Mountain National Park. Not only are the Manitoba sunsets picturesque over Lake Audy but approximately 260 species of birds, moose, elk, black bear, wolves and bison find Riding Mountain National Park a place they like to call home. Picture of a breathtaking sunset over Lake Audy in Riding Mountain National Park in Manitoba. Sunset over Lake Audy, Riding Mountain National Park, Manitoba, Canada.